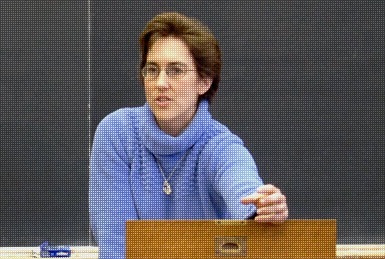 The Open Content movement began dramatically with MIT's Open Courseware. It has taken a great leap forward with Yale's Open Courses, a superb collection of online video lectures and course materials delivered by the University's master teachers. At a time when much of our culture and politics suffers from sham knowledge, vulgarity and parochialism, Yale's Open Courses is unabashedly elitist (in the best sense of the term) and enlightened. One of the world's finest Universities has opened its doors and put on display a rich course of study in the liberal arts. Follow along with Prof. Robert Schiller in Financial Markets as he illustrates the centrality of probability theory in the modern world. Or, let yourself be guided by Prof. Steven Smith in Introduction to Political Philosophy ("O.K. today, what a joy. What a joy! We start Hobbes.") as he leads us via Plato, Aristotle, Machiavelli, Hobbes, and Locke to an understanding of the foundational principles of the U.S. Constitution. Or, enter into Prof. Amy Hungerford's (The American Novel Since 1945) deep reading of Cormac McCarthy's cosmically brooding Blood Meridian. The new courses in Yale Open Courses could not have come at a better time in our nation's history. Gordon Wood, the Alva O. Way University Professor at Brown University, reminds us that the Founders were deeply inspired by the Anglo-American Enlightenment, seeking to realize in their character and actions the virtue of disinterestedness. Understanding history and our place in the world is as much about the recovery and excavation of ideas as it is about the narration of people and events. It is a shame that the earlier meaning of disinterestedness has been all but lost in the modern era. Disinterestedness is not synonymous with being uninterested ("indifferent", "unconcerned", "incurious"). Dr. Johnson defined disinterestedness as being "superior to regard of private advantage; not influenced by private profit." Wood notes in Revolutionary Characters: What Made the Founders Different that in the eyes of the Founders becoming a disinterested "gentleman" was the prerequisite to becoming a political leader. "It signified being cosmopolitan, standing on elevated ground in order to have a large view of human affairs, and being free of the prejudices, parochialism, and religious enthusiasm of the vulgar and barbaric." And it was John Adams who explicitly connects being a gentleman with training in the liberal arts: "By gentleman are not meant the rich or the poor, the high-born or the low-born, the industrious or the idle: but all those who received a liberal education, an ordinary degree of erudition in liberal arts and sciences. Whether by birth they be descended from magistrates and officers of government, or from husbandmen, merchants, mechanics, or laborers; or whether they be rich or poor." In these distressed times Yale's Open Courses and its offerings in the liberal arts is a welcome antidote to the surrounding vulgarity and barbarism in our culture and body politic. Thinking Like A CIO: "The Art and Science of Managing Complexity"
One of my great teachers and mentors has been Donald Lessard, Epoch Foundation Professor of International Management and former Deputy Dean at MIT's Sloan School of Management. Like most students we don't fully appreciate the lessons of our masters until much later. During my tenure as CIO at MIT Sloan I looked forward to our regular meetings. We conducted daily business but I also profited immensely from our wide-ranging discussions, which often assumed the style of Oxford-style tutorials. 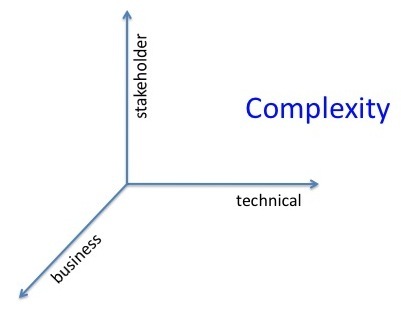 A key lesson I distilled from Lessard: "The essence of management is knowing how to manage complexity." The diagram represents for me a basic framework for navigating IT. The three axes of complexity (technical, stakeholder, business) define the interactive layers of choice, decision, and action. In a series of postings under "Thinking Like A CIO", I will use Lessard's framework as the starting point for analyzing some key issues and challenges in IT management. I will also incorporate interviews, podcasts, and case studies with "master CIOs" to see how they put into practice the art and science of managing complexity.